Memphis went from sleeping 1-2 hours at a time to 6-7 hours by 6 weeks. By 9 weeks, he was sleeping 8-9 hours. NINE GLORIOUS HOURS. Sleepless nights are a given with a newborn. For the first few weeks they eat around-the-clock, every 1-2 hours. Eating can take 30-60 minutes. Which means you're lucky to get 30 minutes of zzz's in before the next feeding. It sounds horrible. Before having a baby, I thought it sounded like a nightmare. Except that you couldn't sleep long enough to have nightmares. But when we were in it, it was all a blur. Yes, we were sleep deprived. But we were also happy. It was a labor of love. A labor of love that was not sustainable. After a few weeks, sleep became an issue. It took at least an hour to get Memphis to settle down to sleep every night, only to wake up 1-2 hours later to eat. The internet told me that he should start sleeping for longer stretches by week 3 or 4 and this was not happening. In fact, he seemed to be resisting sleep more and more. My husband found our hero, on Instagram of all places: Cara. Not me. Another Cara. Cara of Taking Cara Babies. She's a neonatal nurse, wife to a pediatrician and a mother of four. She knows a thing or two about babies. 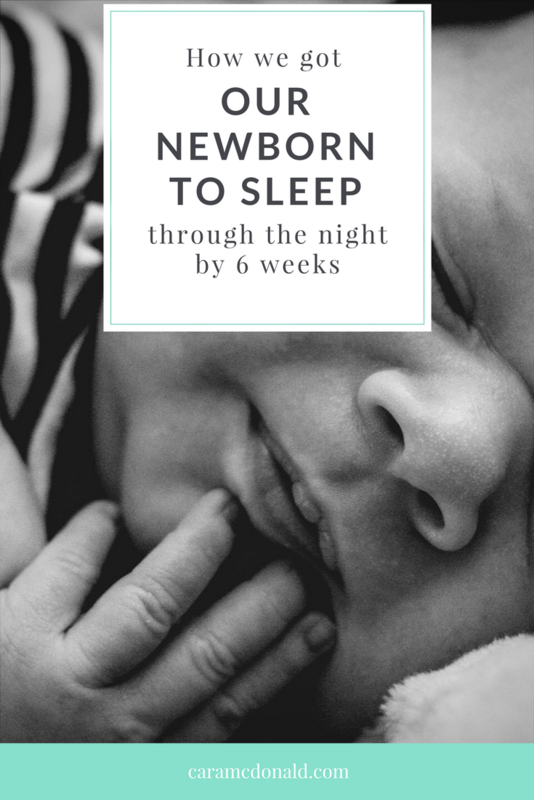 Kris suggested we take her newborn sleep course online and at first I wasn't sure. "We got this," I thought. "We don't need a fancy program." After the fussy day of doom I bought the class out of desperation. Then I learned we were doing it all wrong. What newbs. If you're struggling with sleep, or you're expecting and don't want to struggle with sleep, I highly suggest taking Cara's newborn course: "Will I Ever Sleep Again?" It's NOT sleep training, but helps to lay a healthy sleep foundation. There is no crying involved (yay!) and it's breastfeeding friendly (no starving babies!). If your baby is passed the newborn stage and you're still struggling with sleep, she has a sleep training program for babies 5-24 months. But the goal is that if you use the tips in the newborn class, you're setting your baby up for success and they won't need to go through sleep training. Huzzah. I promise I'm not getting paid to endorse Cara's course. It helped us immensely and I want to share it with anyone who needs to get out of the same boat we were in. We don't follow everything to a "T". After all, every baby is different. Here are some things — many from Cara's advice and some from trial and error — that helped us. Did you know you were supposed to put babies down for a nap? Seems obvious but I'm so new to this parenting thing. I would just hang out with Memphis all day and when he fell asleep on his own, I'd let him nap. When I started actually putting him down for naps in his bassinet on a more regular schedule, he was much better rested. As Cara says, sleep begets sleep. Keeping him awake for longer periods was actually hurting his chances of sleeping through the night. Now I watch for sleepy cues like a hawk and put him down ASAP. Here's a helpful sleepy cues list Cara was kind enough to allow me to share with you. I tried a rigid schedule at first but that didn't work so well for us. We have a general schedule but it's flexible depending on when he gets up in the morning and what we have going on for the day. But generally he gets 3-4 naps per day ranging from 40 minutes to 2 hours. And he doesn't stay awake for much longer than an hour to an hour and a half between naps. Babies have a startle reflex that wakes them up. Swaddling prevents this and also makes them feel nice and cozy, like they did in the womb. We loved the Halo Sleepsacks when he was smaller but he quickly outgrew them. Now we're huge fans of the Ollie Swaddles. Yes, they're pricey. They're totally worth it. They are moisture-wicking so Memphis doesn't get overheated and it's plenty long (he's a tall boy). Here's another thing we did so wrong. We tried to put Memphis to bed when we went to bed. Which was usually around 10-11 p.m. Oops. Turns out babies need an earlier bedtime. Now he goes to bed between 7-8 p.m. and he falls asleep faster and stays asleep longer. No, really. Although we don't have a real sound machine, we play white noise from Spotify on our Echo Dot which works well. But when Memphis is fussy or overtired, it's not enough. One day I was Googling my heart out trying to find help and I read on a mom forum that a hairdryer or vacuum can calm down fussy babies. I thought it sounded crazy but I gave it a whirl and sure enough, it was like a switch. Memphis stopped crying immediately and a few minutes later he was sound asleep. Now when he's struggling to fall asleep, I start the hairdryer for a couple of minutes. Or I actually dry my hair after the shower — two birds, one stone. Kris reads Memphis at least one bedtime story every night. This routine lets him know that it's time for bed ... that this isn't just a nap. And when Kris is traveling for work, he FaceTime's in for story time or sends a recording of him reading a book. Yeah. He's the best dad. All of these things seem to make up Memphis's recipe for a good night's sleep. Every baby is different, but if you found this post in the same frantic Google search I was doing all those nights, I hope that even one of these things will help you. Know that it does get better. With time, patience and trial and error, you'll find out what works best for your baby.